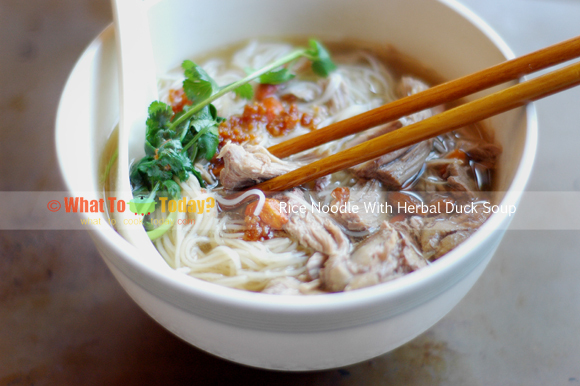 Thin rice noodle are served with flavorful broth made of Chinese herbs and topped with pulled duck meat. 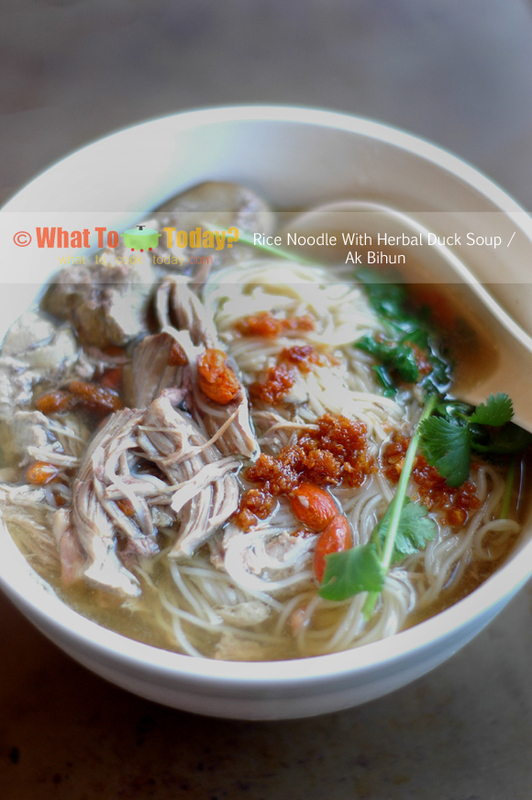 Duck noodle with herb soup or known as ak bihun at our home town where I grew up, Medan, Indonesia, was something I haven’t had for the longest time ever. Ask any Medanese and they will know what ak bihun is. It is a favorite street food for the local for sure, that includes me. 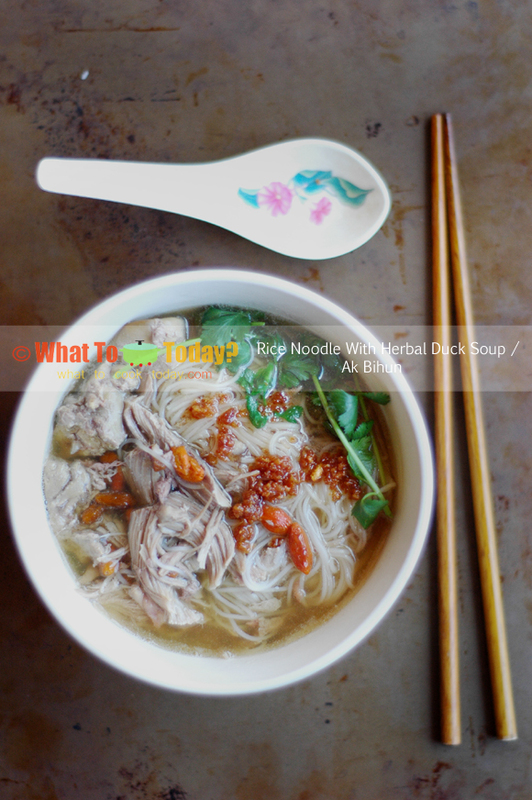 What determines a good ak bihun is the soup itself, which is brewed from duck and several Chinese herbs. If you ask me, Dong Quay, gives the most distinct flavor to the soup. 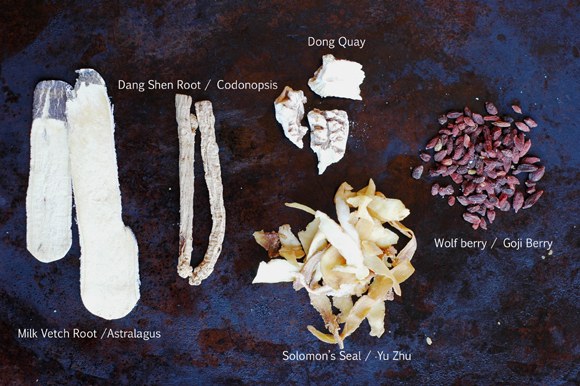 Without this herb, the soup just doesn’t give the same flavor. The commonly used noodle is rice noodle or bee hoon, but other suitable type of noodle can be flat rice noodles or mee sua. The noodle is then served with the shredded duck meat and some offal (if using) and garlic crisp. Such simplicity can bring so much joy into my life. Ask my husband how he likes this ak bihun and he will tell you “It’s a nuclear-bomb-kinda good”. My daughter even licked her bowl cleaned if that doesn’t convinced you enough haha!! Bring the soup back to a rolling boil. Portion the shredded duck meat, gizzard, and liver into each bowl. Ladle generous amount of hot soup with some wolfberry over the noodle. Top with garlic crisp and a little bit of the oil and garnish with some cilantro leaves. Serve immediately. 🙂 hope you like it as much as we do. Any suggestion to improve is always welcomed too. I miss this ak bihun so much. Used to have this every weekend, and conveniently the ak bihun vendors are just a block away from my home in Medan. I really want to try this recipe since I;m not able to find this kind of food here in London, Ontario. Thanks for posting this, and I will try to find the herbs here. Hi Titin, I love ak bihun so much too. I hope you can find the herbs 🙂 Thanks for stopping by.